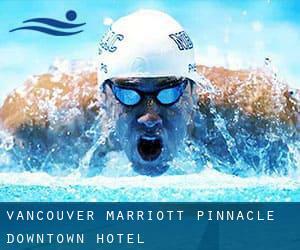 Visiting Vancouver and looking for a location to swim? Nice option! Don't neglect to tell us how did it go. Introducing now Vancouver Marriott Pinnacle Downtown Hotel swimming pool, a great swimming pool sent by a swimmer like you few days ago. Have you visit this pool? Do you work here? Please, contact us when you have data that you feel is gonna be useful and remember from now on you can now promote each and every pool just by sharing this page with your friends or adding comments in the Facebook boxes below. Come on and help this pool to be the first in Vancouver! Among all the activities supplied by the centre, if you are thinking about swimming you may delight in 52 feet, Indoors. Just in case you would like to contact this Swimming Pool before dropping by, we only know the phone number. Write down the GPS coordinates we have on our file for this Pool, so you can enter them into your GPS to support you locate the Aquatic Centre easily. Updated on 2019 900 West Georgia St. , Downtown , Vancouver , BC , CANADA (Postal Code: V6C 2W6). Among all the activities offered by the centre, if you are interested in swimming you are going to take pleasure in 50 feet, Indoors. Just in case you want to get in touch with this Swimming Pool before dropping by, we only know the phone number. Updated on 2019 837 West Hastings Street , Downtown , Vancouver , BC , CANADA (Postal Code: V6C 1B6). This sports centre delivers 25 meters, 5 lanes, Non-Chlorine Sanitized, Indoors. Contact information for this Swimming Pool similar to phone number and email address are number. Updated on 2019 1661 Napier St. , Grandview-Woodland , Vancouver , BC , CANADA (Postal Code: V5L 4X4). Among all the activities provided by the centre, if you are interested in swimming you can enjoy 25 meters x 12.5 meters, Indoors. If you'll want to contact this Pool, email address and phone number are both number. Updated on 2019 6260 Killarney St. , Fraserview , Vancouver , BC , CANADA (Postal Code: V5S 2X6). This sports centre offers 25 meters, 6 lanes, Non-Chlorine Sanitized, Indoors. Contact information for this Pool for example phone number and e-mail address are number. 2001 Nanton Avenue , Quilchena , Vancouver , BC , CANADA (Postal Code: V6J 4A1). Swimmers like you reported 25 meters, 6 lanes, Indoors. Unfortunately we do not have the email address of this Swimming Pool, but we can provide you with the phone number. Updated on 2019 3990 West 14th Ave. , West Point Grey , Vancouver , BC , CANADA (Postal Code: V6R 4H2). This sports centre gives 25 meters x 13 meters, Indoors. Contact information for this Pool such as phone number and email address are number. Updated on 2019 2929 East 22nd Ave. , Renfrew-Collingwood , Vancouver , BC , CANADA (Postal Code: V5M 2Y3). Swimmers like you reported 25 meters x 15 meters, Indoors. Unfortunately we do not have the e-mail address of this Pool, but we can give you the phone number. Updated on 2019 6121 University Blvd. , University of British Columbia , Vancouver , BC , CANADA (Postal Code: V6T 1Z1). Among all the activities offered by the centre, if you're enthusiastic about swimming you might appreciate Olympic size x 25 meters, fast/slow/medium speed lanes, Indoors. If you need to contact this Swimming Pool, email address and phone number are both number. Updated on 2019 5851 West Boulevard , Kerrisdale , Vancouver , BC , CANADA (Postal Code: V6M 3W9). Among all of the activities offered by the centre, if you are interested in swimming you will enjoy 30.3 meters x 12.7 meters, Indoors. Just in case you would like to contact this Pool before dropping by, we only know the phone number. Updated on 2019 535 Hornby St. , Downtown , Vancouver , BC , CANADA (Postal Code: V6C 2E8). This sports centre offers 25 meters x 15 meters, 3 double lanes, Indoors. For this Swimming Pool, only phone number is number here. 950 West 41st Avenue , Oakridge , Vancouver , BA , CANADA (Postal Code: V5Z 2N7). Swimmers like you reported 25 meters, 4 lanes, Indoors. Phone number and email address are number for this Swimming Pool. Updated on 2019 4575 Clancy Loranger Way , Little Mountain , Vancouver , BC , CANADA (Postal Code: V5Y 2Z5). Among all of the activities offered by the centre, if you are interested in swimming you can appreciate Olympic size x 16.8 meters, 8 lanes, 1.5 meters - 3.8 meters depth, 1.5 meters - 3.8 meters depth, Indoors. Just in case you need to get in touch with this Swimming Pool before dropping by, we only know the phone number. Updated on 2019 700 Templeton Drive , Grandview-Woodland , Vancouver , BC , CANADA (Postal Code: V5L 4N6). Swimmers like you reported 25 meters x 12 meters, 6 lanes, 1.1 meters - 3.3 meters depth, 1.1 meters - 3.3 meters depth, Indoors. Unfortunately we do not have the e-mail address of this Swimming Pool, but we can provide you with the phone number. 4175 West 29th Ave. , Dunbar-Southlands , Vancouver , BC , CANADA (Postal Code: V6S 1V6). Among all the activities offered by the centre, in case you are considering swimming you'll get pleasure from 25 meters x 13 meters, 6 lanes, Salt Water, Non-Chlorine Sanitized, Indoors. Just in case you want to contact this Swimming Pool before dropping by, we only know the phone number. Updated on 2019 1050 Beach Ave. , Downtown , Vancouver , BC , CANADA (Postal Code: V6E 1T7). Swimmers like you reported Olympic size x 20 meters, Indoors. Unfortunately we do not have the e-mail address of this Swimming Pool, but we can give you the phone number.